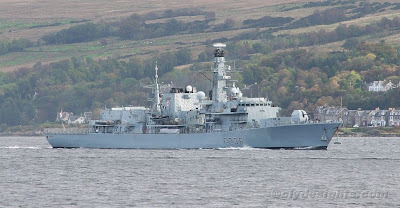 Despite not taking part in Joint Warrior 092, the British anti-submarine frigate MONTROSE was seen leaving Loch Long on Wednesday after she had spend some time on the noise range in Loch Goil. MONTROSE was built by Yarrow Shipbuilders and commissioned in 1993. She is undergoing sea trails at the moment, having just spent nine months in refit at Rosyth Dockyard on the Forth, and is due to rejoin the active fleet later this month. she has just aravied back into plymouth this evening. thusday.